New year, new you right? Well, even though most of us have the best of intentions, we don’t always get around to every single, hopeful priority. As a small business owner or marketing professional, you simply want results. You want to be better than the year before, and observe new growth. Well, we’re here to tell you, that’s entirely possible. Our SMS marketing solutions shed new light on the magical potential of mobile. In addition to combing through our helpful resources, we suggest the following first steps. 1. Check your textword availability. First things first, let’s see if your desired textword is actually available. When picking a textword, keep it simple and unique to your product or service. For example, let’s say you own a restaurant called Joe’s Burger Shack. You might want to go with JOESBURGERS or BURGERSHACK. Don’t be too vague, but at the same time, don’t overcomplicate the selection process. 2. Come up with a list of irresistible offers. Gather up your staff, and make a list of potential mobile offers. For example, patrons of Joe’s Burger Shack might find a $5 Off Your Next Classic Burger offer irresistible. Make a list of potential offers, promotions, and coupon codes. Then hold a vote, and decide which offer would be perfect for an opt in incentive. 3. Promote the heck out of it. Let’s get serious for a second. If you’re not promoting your SMS marketing list, do you really think it will grow? Effort precedes results. Spend time coming up with 3 different promotional outlets that suit the media habits of your customer. For example, maybe you want to tout your SMS list on social media, put up in store flyers, and offer an in person invitation. Link up with top SMS marketing provider, Slicktext.com. 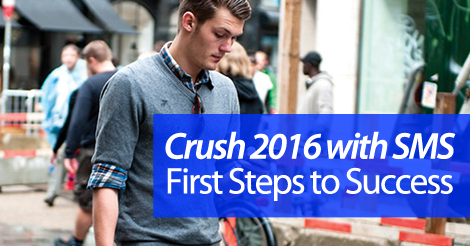 In 2016, focus solely on enhancing your ROI. That’s exactly why SMS is the perfect solution. Not ready to make a monetary commitment? We’re totally cool with that. Head over to the pricing page, and sign up for a free plan. P.S. It’s free forever, not just a limited trial period. Why? Simply put, we want you to succeed. Feel more comfortable signing up over the phone? Give us a buzz at 1.800.688.6290.